Homemade marinara sauce with spaghetti. A delicious dinner recipe served warm with a sprinkling of Parmesan and garnished with basil leaves. Comfort in a bowl! I don’t know why, but it’s taken a little too long to finally get round to sharing my family favourite tomato sauce. 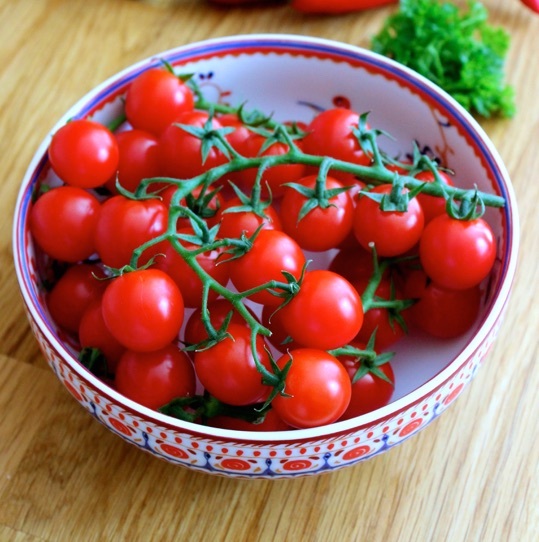 This tomato sauce is absolutely perfect to serve and toss into pasta or top pizzas with and it’s also a recipe I’ve been making for many years now. I guarantee, once you’ve tasted this divine sauce you will never reach for a pre-made tomato sauce ever again! The sauce is rich, sweet and incredibly delicious – this is thanks to the cooking time which allow the flavours to develop and enrich. I think pasta with any kind of sauce is the epitome of comfort food for me. Marinara tossed into the cooked pasta and topped with Parmesan is the best meal and transports me back to summers spent in Italy. I wanted to share a simple and basic recipe because these types of recipes always great to have in your cooking repertoire. As I said this marinara sauce can be used in mostly any Italian dish. As I mentioned above, I top homemade pizzas with it but you could also replace the pasta and use courgetti (zucchini noodles) and enjoy a low-carb meal. I also love to toss in a few grilled or roasted veggies to the mix. The choices are really endless, this tasty sauce is extremely versatile! If you don’t want to use pasta, just simply dip some good crusty bread into the sauce for a quick and tasty lunch/snack. 1. Gently heat the olive oil in a medium saucepan. Sauté the diced onion until soft – about 2-3 minutes. Add the garlic and herbs and continue to cook until fragrant (another minute or so). Season to taste. 2. Add the tomato purée and a pinch of sugar and cook out for another minute. Add the canned tomatoes, lemon juice and half can of water and bring the sauce up to the boil. Once boiling, turn down to a low heat and simmer for 1 and 1/2 hours. It should be thick and glossy by the end of the cooking time. 3. To serve, remove the bay leaves. Boil some water and season well with salt. 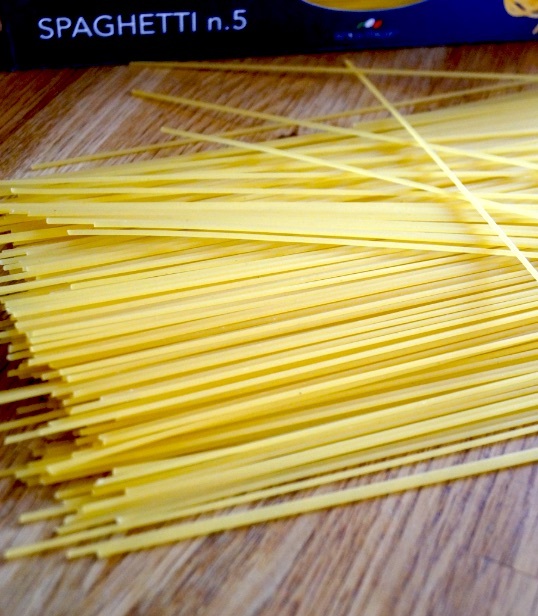 Cook the pasta until al dente, this is usually a couple of minutes less than the packet instructions suggest. Drain the pasta well, reserving a little extra pasta water to loosen the sauce if needed. Add the tomato sauce and toss together with the cooked spaghetti. Season if it needs and serve up in bowls. Sprinkle with freshly grated Parmesan and garnish with basil leaves. Best eaten warm, but the sauce is also great packed up for lunch the next day. This sauce will store in an airtight container in the fridge for up to 1 week. I love serving this pasta with a slice of homemade Rosemary Sea Salt Focaccia! i eat pasta at least 1-2 times a week so this is definitely something i would love to try..thank you for sharing. Yum – I love going back to the basics! This looks great, Jess! This spaghetti sounds fantastic, Jessica! Your pictures are so gorgeous. I could dive right into this for breakfast! Nothing beats a classic bowl of comfort than this! Homemade sauce is the BEST! As far as I’m concerned, going out for Italian food is pointless… you can make it at home and its so much better and cheaper! This sauce looks great! How wonderful with a recipe on homemade tomato sauce – way better than the store bought kind I guess 🙂 Thanks for sharing! That looks so fresh and delicious, I am so glad you got around to sharing the recipe with us. This is perfect! My mom has been asking me for a simple and easy tomato sauce recipe. Feel honoured that you’ve shared your prized recipe with us, Jessica! Love that, though … you can’t go wrong with tried and tested! 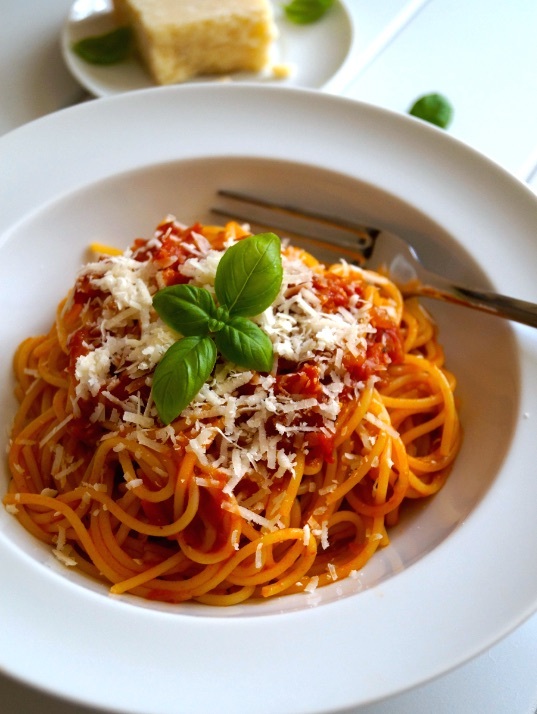 I also think you can’t go wrong with spaghetti and marinara sauce … mmm, I’ve had a big Sunday lunch today but I could just eat a big bowl of this! looks so fresh! love it Jessica! Marinara sauce is like my favorite condiment on the planet! I’ve always wanted to try it homemade and I think you just convinced me. Looks awesome, Jess! This is so gorgeous! 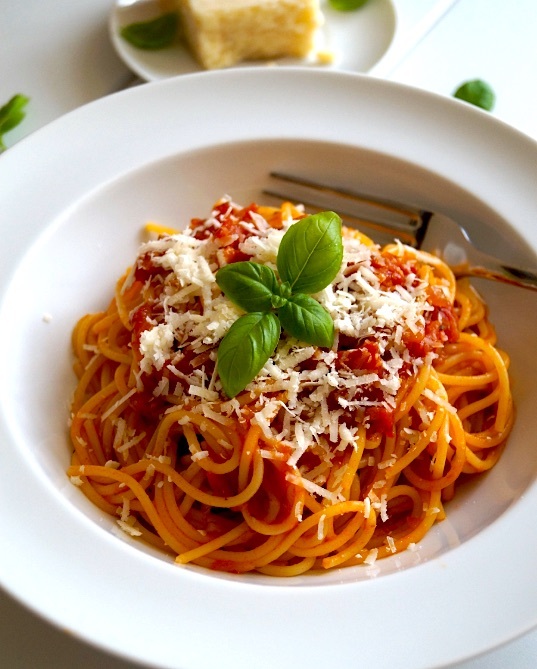 Spaghetti is one of my favorite at home dishes and I’m always on the lookout for great marinara recipes, going to have to try this one it sounds delicious!! So simple, so tasty. Simplicity is key elements in this lovely dish you prepared so well! I usually make it with even less ingredients (I skip the stock cube). Yum! Thanks so much Daniela – that means a lot to me! I adore your Italian recipes! 😀 Next time I think I will definitely try making the recipe without the stock cube – thanks for your tip! I am sorry but when do you add the lemon juice after what point? It seems it is skipped in the description. Thanks. Thanks for letting me know, updated it now.